& So Chaud Matte Lip by MAC. All available at Westfield Chermside. It is official, winter has left Queensland. As I pack away my knits for another 9 months I look towards my spring/summer wardrobe updates & must-haves. So I headed into check out the latest fashion offerings from Westfield Chermside. Some of my premium fashion favourites like Furla, Alice McCall, Tony Bianco opened this month in store and that was excuse enough to visit. Incase you are new here, tees are a must-have for me. They are easily my most versatile piece in my wardrobe so it's no surprise that when I found this 'Amore' Tee at Seed I had to make it mine. What is better than a plain white tee? A plain white tee with french on it. The easier the shoe the better in the warmer months. The slides mean you have one less obstacle between you and having sand between your toes when you hit the beach. I fell in love with these slides from Tony Bianco. They are cotton with a frayed edge. I love them so much I am thinking of heading back to get them in natural also! If you haven't guessed by now I have been converted to wide leg pants. Normally I would call you crazy if you suggested I wear long pants in the summer months but the trick is a wide leg. In a light weight linen or cotton, they are the perfect update to your summer wardrobe. The wide leg style above from Seed won me over with an origami style waistline that folds rather than the typical drawstring or gathered waist band. Sunglasses are the easiest way to update your wardrobe for spring/summer. After trying on everything in Bailey Nelson I set my eyes on these yellow toned Emery frames. They instantly lift a simple outfit and brighten the face. What are your wardrobe must-haves & updates for the warmer seasons ahead? This post was created in collaboration with Westfield Chermside. I was first drawn to yellow amongst the craziness which is a Zara clothing rack back in March. The colour made me happy and I thought it made me look like a banana so I bought it. Since that yellow knit, I bought a yellow pleated skirt later in April and added this tee to my wardrobe just last week. Since march I have been starting to notice yellow everywhere, even Man Repeller has declared that it will be taking over millennial pinks position. All I can say is 'Why can't we have both?' in the girl's voice from the Old El Paso ads. Sometimes I do feel as though my yellow pieces are a little more difficult to wear. I normally try to pair it with neutral tones like beige, white or grey. Blue denim & yellow is always good pair but I can't seem to shake the feeling that I look like the cartoon Arthur. 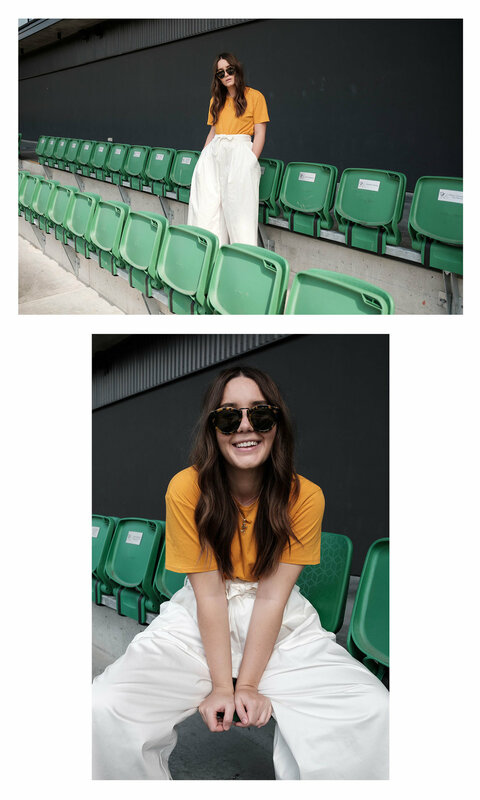 So I thought in today's post I would list why you should be adding some yellow to your wardrobe and how. 1. You can't be in a bad mood while wearing Yellow. 2. You are guaranteed to make someone else smile. I have a 100% compliment rate when wearing yellow. 3. It doesn't matter if you spell mustard on yourself. 1. T-Shirts are the easiest way to try something new in your wardrobe. They are in-expensive and easy to mix in with your already existing pieces. 2. Go the accessories route. Yellow tinted frames are everywhere at the moment but you could try something else like bags or sandals for your pop of colour. If you feel uncomfortable wearing a lot of colour this is the route for you. 3. If you are feeling daring pick up some outwear but I wouldn't recommend investing in an expensive piece as you may not get the wear out of it to make it worth it. 4. Skirts / Pants. Make sure they are in a cut or style that you know you love so you get the wear out of them. I went for a pleated midi because, well, I love pleated minis. 5. Go crazy and mix a yellow top and yellow bottom. I wasn't feeling as conscious as normal so I did it one day to Woolworths. I felt like the sun. Just make sure they are the same toned yellow. So I think Brisbane has decided to skip winter this year and go straight to Spring instead. I am already back to leaving the house in just a tee. I have updated my basic tee with the addition of these amazing wide leg pants and my new bag. The red instantly makes the outfit more exciting and I have already found three different ways to use the bag with all of its different handles.